SemanticGap™ is now proud to offer web site hosting. Our current single domain plan offers 500 megabytes of space, 20 emails, shell access, 10 gigabytes of bandwidth per month, and a bunch of other features all for $10/month. To learn more and possibly sign up goto our hosting page. 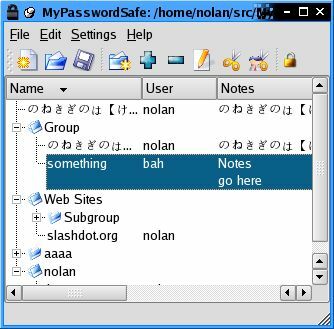 MyPasswordSafe is a password manager for Linux and any other platform that Qt supports. It currently supports Password Safe files. Click here to goto the MyPasswordSafe page. Copyright © 2004-2007 Nolan Eakins. All rights reserved. Semantic Gap and the double spiral logo are trademarks of Nolan Eakins.